There are just some inventions out there that really make sense. The microwave, hairdryers, etc. They make our lives simpler and get things done a lot faster and more efficient. 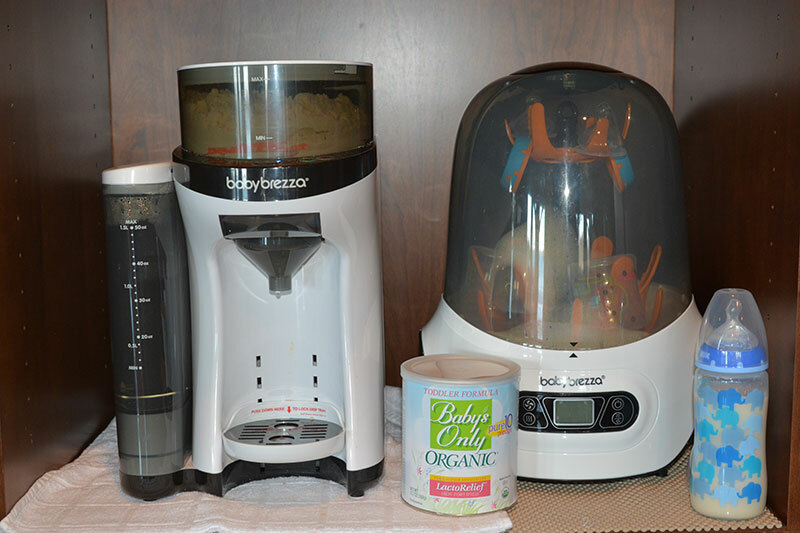 The Baby Brezza is one of these products. First, let me start out by saying that I am not an ambassador for this product, they don’t know me (though I wish they would!) This is just my honest review. I had heard there was a thing that was similar to an adult Keurig but for baby formula. My initial thought was that it was a waste of money because it wouldn’t work and really how hard was it to make a bottle. Heat up the water, add the formula, and shake it up. Ok, first off I will say it’s not hard to make a bottle, but at 3am when you haven’t slept in who knows how long and your eyes will barely open I will say pushing a button is a lot easier than making an actual bottle. This is why we ended up switching to the Baby Brezza and you know what? It’s pretty dang awesome! There is a compartment for water and a compartment for formula (I’m writing a blog soon on what I use for Brex) and with a push of a button the two are combined to perfection. The Brezza has settings for 2, 4, 6, 8 or 10oz and the bottle is the perfect temperature. It says it is the perfect consistency and I would say it is about 95% so I give it an extra little shake sometimes. It takes only mere seconds to make the perfect bottle and when your baby is having a stage 5 meltdown I’m not going to lie, it’s pretty sweet! The machine will run you around $150 about the same price as a higher level Keurig. It has worked with all the bottles we have used with it and we really don’t have any complaints. Our one and only caution is to do your own weight test to make sure the right amount of formula is coming out. The Brezza comes with a handy guide that tells you based on what formula you are using what setting you need to have it on. We saw online that there were some issues with too much or too little formula, so we took an empty bottle and weighed it and then re-weighed it after making a 4oz bottle with the Brezza. We then repeated the process with a hand-made bottle and the weights were very similar. Where the formula and water dispense at the opening sometimes gets a little clogged and I think this messes with the weight so I simply remove the gray plastic piece on the front (the nozzle looking thing) and wipe the base clean where it actually dispenses from. I do this about every three days and have never had any issues. It really is an awesome product and it’s kind of funny Brex is conditioned now like Pavlov’s dogs and when he hears it starting to make his bottle he gets all excited! I have included a demo video. I really hope this helps some of you new parents, or those looking to buy someone special the perfect baby shower gift!